We were out running some errands and it was close to lunchtime. We wanted something that is light on the tummy and the wallet, so we went to McDonald’s and decided to order Mediterranean Veggie McWrap. We were fairly skeptical and weren’t sure what to expect. In fact, we weren’t too enthusiastic either. 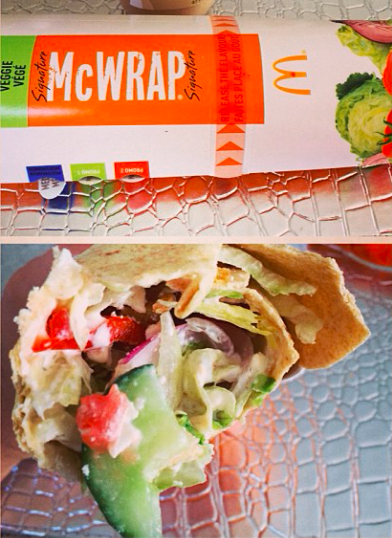 We took a couple of bites of the McWrap and were amazed by the lightness and freshness of it. We loved the medley of flavours bursting in our mouth. We could taste lemon, hummus, cucumbers, fried onions and feta cheese. Every ingredient seemed perfect and was complimenting each other. There was nothing in there that was overpowering or missing. One, we were hungry; two, we were pleasantly surprised by how good it tasted! Overall, we loved the Mediterranean Veggie McWrap! Like many others, we usually order Filet-o-Fish at McDonald’s for lunch or dinner, but Mediterranean Veggie McWrap is certainly a great addition to their menu. Only surprise/con: this McWrap has more calories, carbs, fat and sodium than a Filet-o-Fish sandwich. Categories: Product Reviews, Restaurant Reviews | Tags: canada, dinner, Halal, Halal Food, lunch, McDonald's, McWrap, Mediterranean Veggie, Mediterranean Veggie McWrap, Ontario, Toronto, Vegetarian | Permalink.